Arsenal attacking midfielder Alex Iwobi has come out on top of a surprise list so far this season – in joint first place for most nutmegs completed in the Premier League. The Nigeria international is joined by West Ham winger Felipe Anderson on five so far this term, showing he truly is a skilful and tricky performer up front. Many Arsenal fans will no doubt want to see more end-product from Iwobi after some inconsistency since he made his first-team breakthrough a few seasons ago. 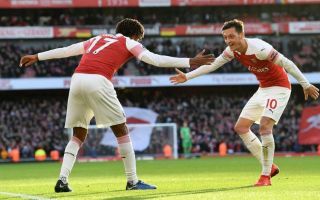 However, the natural talent clearly seems to be there as the 22-year-old also looks to have come on leaps and bounds under new manager Unai Emery this season. If Iwobi can continue to use this skill to get past opponents then it’s hard to imagine he won’t start banging in a few more goals or picking up a few more assists soon enough. Eden Hazard and Leroy Sane are next on the list with four, while the likes of Wilfried Zaha and Roberto Firmino are close behind on three nutmegs this season.